Michael Larabel of Phoronix runs some benchmark tests for FreeBSD versions 11.1, 12.0-CURRENT, and TrueOS 18.03. 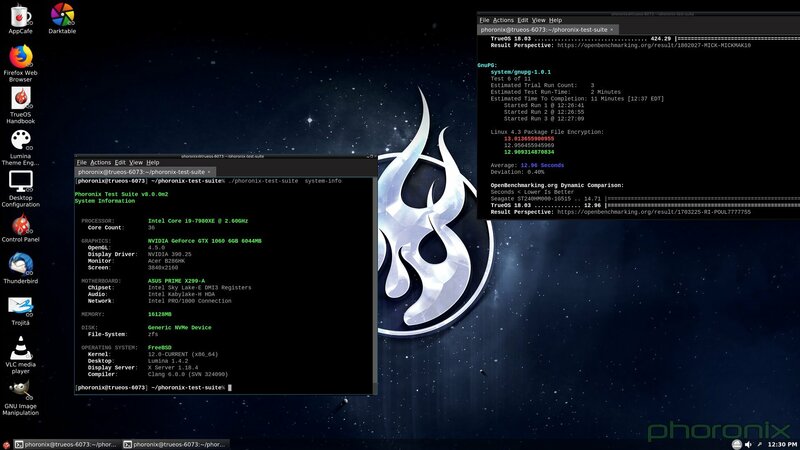 The tests were run via the Phoronix Test Suite 8.0 ranging from blogbench to system decompress. You may view the full report at the link below. While running some fresh benchmarks this week, here are some test results using FreeBSD 11.1-RELEASE as it debuted last year, FreeBSD 11.1-STABLE with all current updates including for Spectre/Meltdown mitigation, FreeBSD 12.0-CURRENT as its current form of development and with Spectre/Meltdown mitigation and note that FreeBSD CURRENT ships with some debug bits enabled, and then the recently released TrueOS 18.03 that is derived from FreeBSD 12.0-CURRENT and also mitigated against Spectre/Meltdown. Never was a fan of Artificial Benchmarks like ZDnet bogus Windows Test Suite. Nothing to see here. Sure, FreeBSD 12-Current may not be _faster_, but it seems to keep up, and exceed same hardware performance using the Fedora 26 release. Solid ZFS, plus accelerated drivers for Haswell/Intel video. Pefs encrypted directories are a big bonus…works ‘system-wise’ better than TrueCrypt.